Saracens chief Edward Griffiths says the club will deliver a 'fantastic match-day experience' when they move to Copthall Stadium next year. The stadium in Barnet is currently being transformed into a 10,000-capacity venue with a synthetic pitch. Saracens' first game there will be against Exeter Chiefs on 16 February. "We're confident of delivering a really fantastic sporting venue and a fantastic experience for our supporters," said Griffiths. 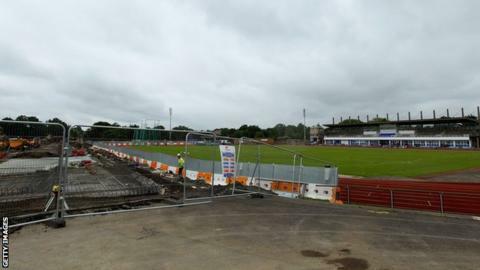 "We're going to have four video screens, one in each corner of the ground, the only ground in the country to have that; we're going to have an artifical turf pitch, again the only ground in the country to have that, I think we're going to have an awful lot going on and I anticipate we will be full," he told BBC Three Counties Radio. Saracens have confirmed that prior to the move to Barnet, they will play matches at a number of different venues, including their current home in Watford, Twickenham, Wembley, Stadium MK, an as yet to be confirmed central London venue, and twice at grounds "further afield" - which could mean playing abroad. However Griffiths dismissed concerns that the team could be unsettled by such a nomadic existence. "It was always going to be a season of transition and I'm pretty happy that we've come up with a season that will have quite a few unique and spectacular events in the first half of the season, before settling into our new home in the second half of the season. "The players like big events, they like big crowds and they like big occasions and that's really what we've tried to provide," he added. "I went through the schedule with the players and the response from them and the coaches was overwhelmingly positive. "We are a club that tends to see good things rather than bad things - I think the relentlessly positive approach probably shines through."